OXFORD, Miss. – Organic chemistry was the game changer for Mike Glenn, retired executive vice president for market development and corporate communications at FedEx Corp. and a committed University of Mississippi alumnus. The Memphis native came to Ole Miss in 1974 as a pharmacy major. He made it through his freshman year, but his attempt at organic chemistry as a sophomore made him realize pharmacy was not for him. “I changed my major and entered the business school, which was a much better fit for me,” Glenn said. “Most of the classes, except for accounting, came fairly easily for me. Glenn credits what he learned as a student in the business school with giving him the skills and knowledge he needed to move through the ranks at FedEx into senior leadership. The importance of interacting well with people and treating them professionally and respectfully were also skills Glenn learned while in school, he said. In turn, he has served as a guest lecturer for the MBA program and presented FedEx case studies to undergraduate students. Glenn is an outstanding supporter of the school and the university, said Ken Cyree, dean of the School of Business Administration. FedEx is a publicly traded company with annual revenues of $60 billion. Many Ole Miss business students vie for positions within the company. “When I spoke to our FedEx intern class each year, it was always fun for me to identify the interns from Ole Miss and let them know how proud I am to be an Ole Miss graduate,” Glenn said. Glenn showed his partiality toward Ole Miss when asked what sort of advice he might offer a high school student considering the university. Because of his enthusiasm for the university and so many graduates have been or are employed by FedEx, Glenn said it is important for the company to have a visible presence on campus. This enthusiasm resulted in the company’s sponsorship of the FedEx Student-Athlete Academic Support Center and additional financial support for other academic programs. “Mike Glenn is a truly exceptional individual who has a tremendous impact on every endeavor he undertakes, from effecting change at a global company to nurturing the development of students,” Chancellor Jeffrey Vitter said. “Mike is to be commended for his deep commitment of time, energy, passion and resources that have contributed to the transformation of our university. An Ole Miss alumna and former FedEx employee reiterated Glenn’s influence as a leader. 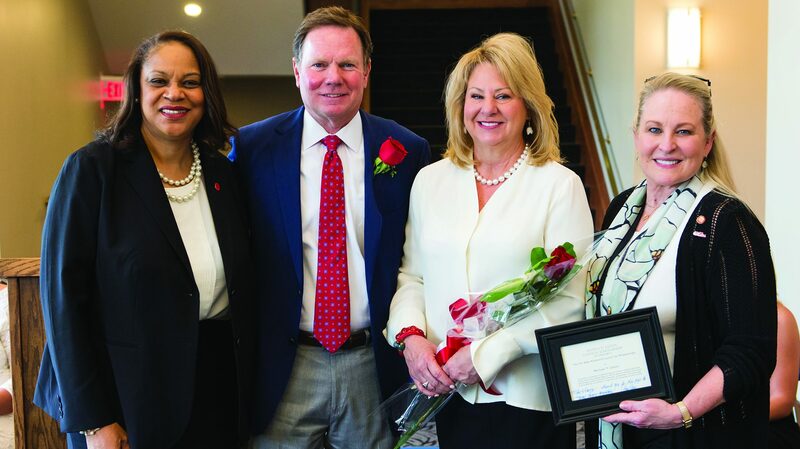 In 2017, Glenn honored his wife by endowing an Ole Miss Women’s Council scholarship in her name. “Donna has a degree in journalism, and she is a very talented communications professional,” he said. “After her career at FedEx, she has continued to use those skills in support of numerous charitable organizations in Memphis. Glenn credits his education at Ole Miss with giving him the confidence he needed when he began his professional career as a sales representative in the elevator division of Dover Corp. in Memphis, and two years later began taking classes in the evenings to earn his MBA at the University of Memphis. After completing his MBA, he went to work for FedEx, where he ultimately came to serve in the executive vice president position as well as one of five members of the company’s executive committee. As a mentor to Ole Miss students, Glenn stresses the cultivation of strong communication skills and the ability to work as part of a team. “Unfortunately, I have seen many very bright individuals fail to maximize their potential because they lacked the strong communication skills and could not be a productive member of a team,” he said. “Finally, it is never too early for a student to start developing his or her leadership skills.